We are in the midst of a series called You Are Not Your Own from 1 Corinthians 8-10. These three chapters, though broken into chapters, constitutes one teaching about how we work and have fellowship with each other. Chapter 8 opened with certain Corinthian Christians declaring that they have knowledge, know that idols have no real existence, and there is no God but one (8:1,4). Therefore, they argued they could go into idol’s temple and participate in the sacrifices and eating of meat that happens in that temple (8:10). Paul has three arguments as to why they are wrong in how they are using their knowledge. First, in chapter 8 Paul declared that you are causing other people to sin and fall away from the faith. The first principle is that we would never use our knowledge to cause another person to commit sin. The second argument against the Corinthians is in chapter 9 where Paul taught that just because we have rights does not mean we exercise our rights. We submit our freedoms and rights for the sake of the gospel. We must become all things to all people so that by all means we might save some. In fact, not submitting our rights for the sake of the gospel and for the faith of others is how we disqualify ourselves from obtaining the prize. The third argument the apostle Paul makes is in chapter 10 which we will now consider in this lesson. Paul wants to show these Christians how easy it is to fall into idolatry. Paul teaches the warning about being disqualified in 9:24-27 so that we would be great concerned about being disqualified ourselves. The example of the people of Israel shows that idolatry is easy. Paul describes how the people of Israel experienced all the same spiritual blessings (10:1-4). But look at verse 5 carefully: “Nevertheless, with most of them God was not pleased, for they were overthrown in the wilderness.” Even with all of the spiritual blessings Israel had and with all the amazing miracles they experienced, most of Israel fell in the wilderness. In short, they were disqualified on their journey to the promised land. So what happened to them? Why was God not pleased with them? Verse 6 says that they desired evil and in verse 7 that was displayed in idolatry. Idolatry was the problem. We so easily define idolatry as worshiping created things made of stone or metal or wood. But you will notice that these are not the things that are described as idolatry in this section. Notice that Paul does not pick out the time when the people made the gold calf. Rather, Paul describes the result of the gold calf in verse 7: “The people sat down to eat and drink and rose up to play.” When we studied Exodus we saw that the people’s actions were described as “breaking loose” (Exodus 32:25). This is what idolatry is all about. It is not about gods and images. It is about doing what we want to do in the name of worshiping another. We do what we want with the justification that we are doing for God or for the gods. Notice that this is what pictures in this passage. He pictures people doing what they want to do and focusing on their selfish desires. Committing sexual immorality is in verse 8. Sexual immorality is doing what your flesh wants to do. In verse 9 the people desired evil by declaring that God had brought them out of Egypt to die in the wilderness and God killed them with snakes. We are telling God that he is doing a bad job at leading our lives. His direction to the promised land is not good enough for us. In verse 10 we see that grumbling and complaining is also the heart of evil. We must see that idolatry is so easy. Obeying our desires is so easy. Idolatry is ultimately the worship of self. We do what we want in the name and justification of serving some sort of god. Paul says that these things are not only examples for us (10:6,11), but they were also written down for our instruction. God is trying to teach us Christians. We are to learn that idolatry is easy. It is so easy to obey your own desires. This is ultimately what these Christians in Corinth are doing. They are using their knowledge to allow their selfish desires to be fulfilled. Paul will speak to that more in a moment. But let us notice the warning that follows. In short, we need to be careful and watch out. If you think you stand, you better watch out so that you do not fall. These Christians did not think they had an idolatry problem. They had knowledge. They are spiritually strong. They know what they are doing. Paul tells them that this is the kind of thinking that leads to spiritual disaster. Never treat temptation lightly. Never think that you have no problem with a sin or temptation that you allow yourself to be exposed to that circumstance. Watch out because you will fall if you allow yourself to walk close to the fire. There is a way of escape to get away from these things. Do not think you stand. Be humble. Be observant. Be careful. Be thoughtful about your soul. God is faithful to you and you need to escape from the temptations that will come against you. How often we put ourselves in bad situations that could easily be avoided? How often we allow ourselves to be tempted to obey our sinful, fleshly desires by putting ourselves in a tempting situation? Paul is saying that we need to get away from it. This is where Paul goes in the next paragraph. Look at verse 14. “Therefore, my beloved, flee idolatry.” Run away from this. What Paul does in verses 15-22 is show that what these Corinthians are doing is wrong not only because they are causing other people to sin and not only because we do not use our rights and freedoms to harm the gospel, but also because what they are doing by going into the idol’s temple is actually idolatry. Look at the point Paul makes in the following verses. In verses 16-17 Paul says that when we eat the bread and drink the cup we are participating in the body and the blood of Christ. Eating these things shows a participation with Jesus. We who are many are joining together into one body to partake and participating with Jesus in the memorial. In verse 18 Paul shows the same thing with Israel. When they ate of the sacrifices they were participating in the altar. They were participating in the worship. Now does this mean an idol is anything (10:19)? Absolutely not! The problem is not that the idols are anything. Their knowledge is correct. Idols are nothing. However, when they participate in these sacrifices with their knowledge they are joining themselves to demons. Their worship is not to God but to demons. We cannot share with the Lord and with idols for by doing so we are provoking the Lord to jealousy (10:21-22). At the end of the day what the Corinthians are doing is idolatry because eating together is fellowship together. Eating together is participation together. Just because you know an idol is nothing does not mean you can participate in it. We cannot participate in sinful things. This brings Paul to the end of this discussion by clarifying the Corinthians’ thinking toward greater spiritual maturity. In verse 23 you see that the Corinthians continue to stand on their freedoms by saying, “All things are lawful.” But just because something is permissible does not mean that it is beneficial for us or will build us up or others up. The key principle is stated in verse 24 which has been a consistent message in this section. “Let no one seek his own good, but the good of his neighbor.” Just because something is lawful does it mean that it is good for others. Do what is good for others. Do not just think about yourself. Paul applies this to one more situation about food. In verses 25-27 Paul essentially says that food is food. Eat food that is sold without raising questions about its origins because everything belongs to the Lord. So it is idolatry to eat in the idol’s temple. But buy and eat the food that is sold without questioning if it was part of an idol’s sacrifice or ritual. But verse 28 indicates when there would be a problem. If an unbeliever sees this food as part of idol worship, then do not eat for the sake of who told you this. It is important to consider that the person saying this is not just saying this randomly because most meat came from an idol’s temple. That was just first century life. It would be a declaration that we are eating this meat because of what the pagan gods have done or provided. They are making a religious point about the food and under these conditions you cannot eat because it would continue their false understanding about gods and idols. We would be confirming their idolatrous convictions and signaling our endorsement of their worldview. But now Paul cautions taking this too far in verses 29-30. Our freedom is not stopped by what other think. We are not bound by the consciences of others. You see that the Corinthians were not to go into a person’s house and ask them what they think about this meat before eating. We know it is just meat and the idol is nothing. So sit down and eat without questioning. The problem is if the person makes a religious announcement about it. Think about it. If we have to know the conscience of every person before acting, we could never do anything. We cannot be controlled by what other people might think. We are controlled only when we know what they believe because they proclaim it. For example, I do not need to forbid myself from going to the Church of the Holy Sepulcher because people might think I am worshiping the possible location site of the tomb of Jesus. But if it was announced that all who enter the site are worshiping, then that is something different. This is the idea. Our freedom does not depend on what others mistakenly think. Otherwise we would have no freedom at all. So use your freedom. Paul is not trying to erase the freedoms that we enjoy in Christ. Paul does not say that we have no freedom to do anything in Christ so be paralyzed in your life. But if someone says that this is what we are doing, then we have a different issue. There are parameters for using our freedoms. We do not want to make people sin. We do not use our freedoms to harm the gospel. We do not use our freedoms to confirm a false worldview about God. So Paul concludes with four life points. These are four considerations for how to live with our freedoms in Christ. First, whatever we do needs to be done for God’s glory. If we eat or drink or whatever else we do, God should be glorified in what we are doing (10:31). 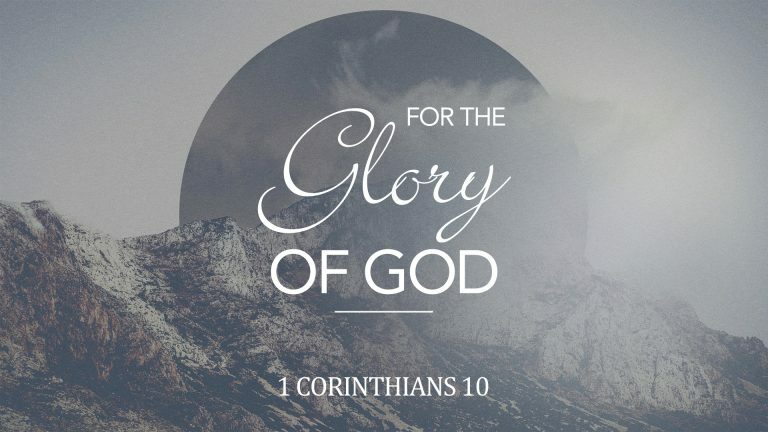 God needs to be glorified in our lives no matter what we are doing. There is no freedom or action that we can participate in that would show dishonor for God. We live our lives to show that it is all about God. We show that we love God as we use our freedom. We do not use our freedoms so that God would be blasphemed as Israel did. We are to be lights in the world, showing people God, not anything else. We must treasure God, not our freedoms. Second, do not cause the shipwreck of people’s faith (10:32). We cannot do anything that destroy people’s faith, causing them to fall away from the Lord. What Paul has shown is that their own sinning by eating in the idol’s temple has caused others to sin. We often think of our sins in such selfish terms, as if we are not hurting anyone but ourselves. But our sins hurt many other people, not only directly but indirectly. We certainly hurt people directly, which we often do not think about when we sin. But think about the encouragement to sin that give to others when we choose sin. My sin hurts you. Your sin hurts me. Our sins hurt each other. We can lead each other and encourage each other to sin through our sins. This is why repentance and confession are so important so that people know that we acknowledge our sinning and we do not excuse our behavior. We are accountable to God and to others for our actions. We cannot use our freedoms to sin nor use our freedoms to cause people to lose their faith. Third, do not seek your own advantage or rights, but seek the good of others (10:33). Do not do what is good for you. Do what is good for others. Always think about how we are helping the faith of another. What are we saying to each other that will help their faith? What will we say to people in the world that will show them God? What are we doing for each other that will build their faith up? What are doing in the world that will give them spiritual knowledge? Think about what idolatry ultimately is. Idolatry ultimately is self-seeking. Idolatry is doing what we want and seeking our own desires. We are desiring evil when we desire ourselves over desiring the love and ways of the Lord. Fourth, imitate Christ (11:1) as seen in the example of Paul. There is nothing more against the example and love of Christ than living for yourself and harming others. Jesus sacrificed himself, suffered harm and loss for the sake of the world. Paul has told the Corinthians about how he did not take advantage of the many rights he has, even rights commanded by God like receiving pay for preaching the gospel, in order to sacrifice himself for their sake. Paul imitated the life of Christ. We are to imitate Paul because he imitated Christ. Sacrifice yourself for others. Give yourself to others. Live with the concern for the spiritual welfare of others.